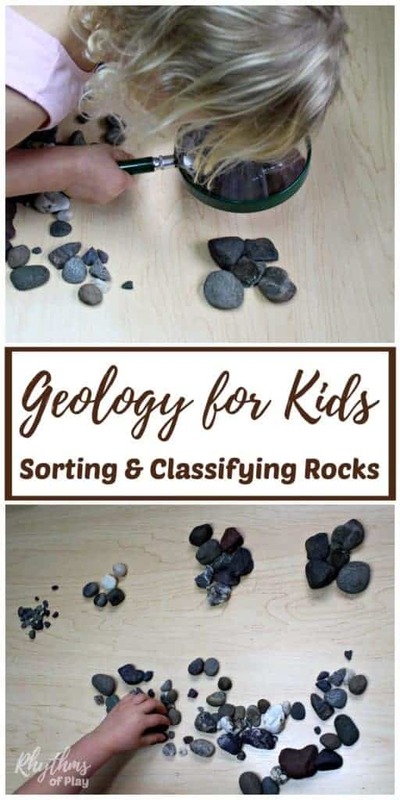 Sorting and classifying rocks is an easy science activity for toddlers, preschoolers, and grade school students. In geology, rocks are typically classified into igneous, sedimentary and metamorphic rocks. This earth science activity does not classify rocks in this way. Instead, basic classifications are used so young children can easily complete it. 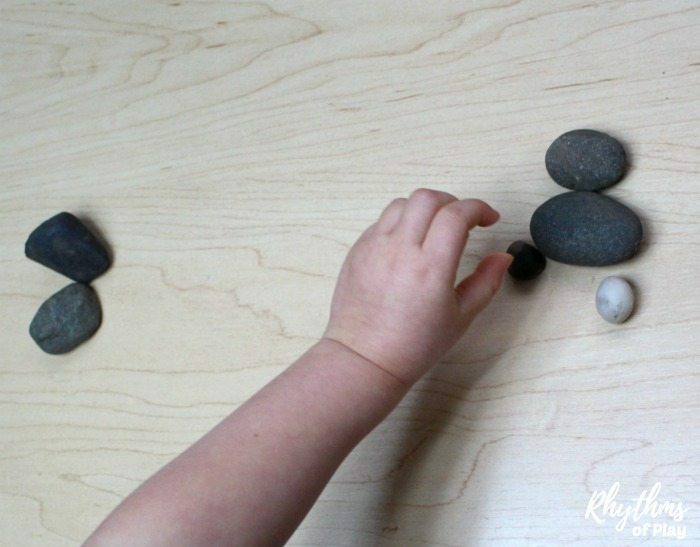 You may also like Rock balancing Stone Stacking Art for Kids and Human Sundial Shadow Science Experiment. 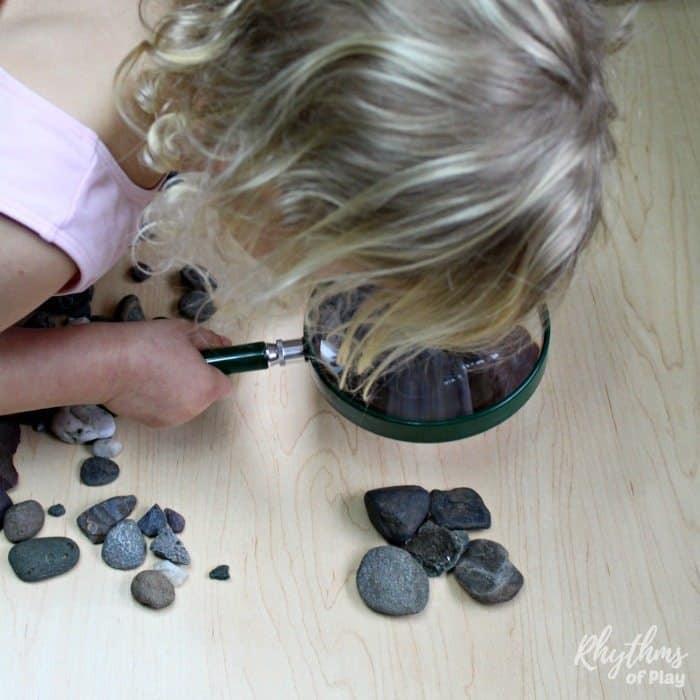 To do this activity, you will first need to go on a nature hunt for rocks. Nature hunts are another fun and educational activity to do with your kids. Do your best to find a collection of different sizes, shapes, textures, and colors. 1. Place rocks in a pile on a work surface. 2. 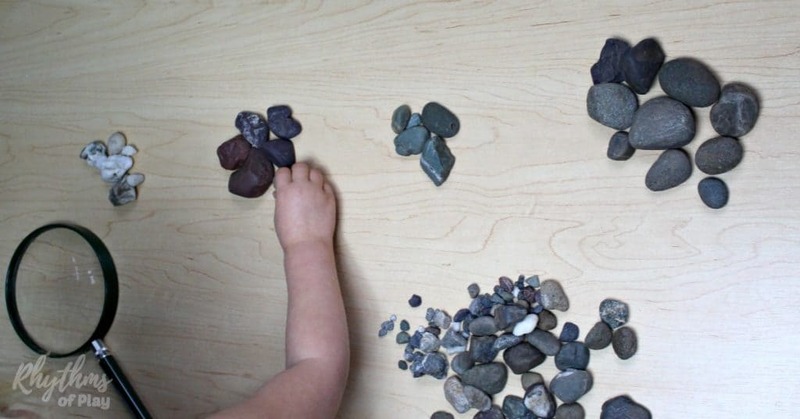 Instead of telling your child(ren) how to sort the rocks, ask them if they see any differences in the rocks. If they are stumped encourage them to investigate them more closely by touching them or looking at them through a magnifying glass, etc. Sort the rocks based on their answers. 3. 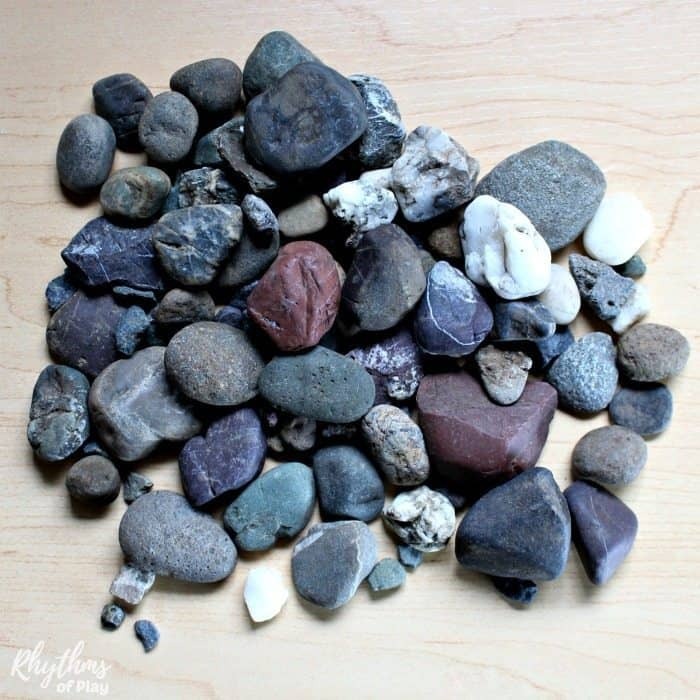 Add in a math component by asking your children to count the number of rocks they have placed in each category. Next, have them say how many of each category there are. As an example, your child might say there are 6 white rocks, 7 red rocks, 5 green rocks, and 10 gray rocks. Write this down in your science notebook or on a scrap of paper for them. You can create a graph of your results to extend the activity once you are finished sorting and classifying the rocks. 4. 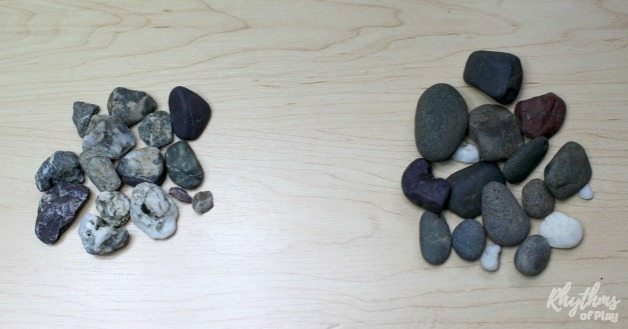 Place the rocks back into a pile and ask what other differences they see. Sort again based on their answer. You don’t need to sort every last rock each time. Some rocks may be difficult to sort depending on the classification. 5. Repeat until you run out of ways to sort and classify the rocks. 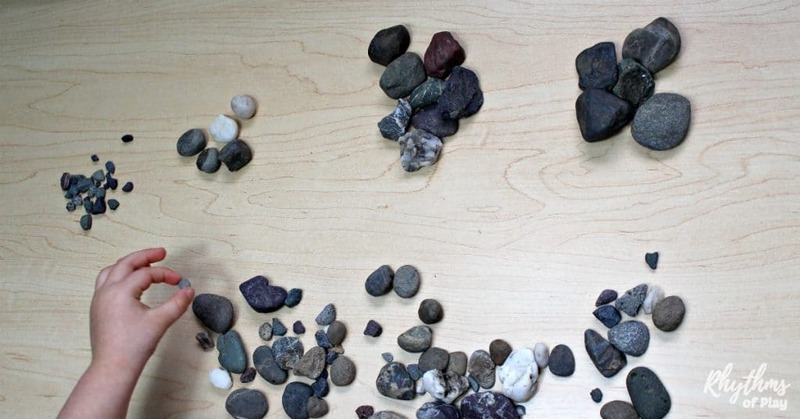 For this activity, my 3-year-old daughter sorted and classified rocks based on size, color, texture, and shape. See photos below. My daughter sorted extra small (pebbles), small, medium, and large rocks. Learning to sequence using natural items such as rocks is a common forest school learning activity. You don’t have to bring nature home in order to practice sorting and classifying. My daughter and I also enjoy sorting by size when we go on nature walks. We don’t collect the rocks when we do this. Instead, we point to pebbles, rocks, and boulders when we see them calling out what they are. The colors you sort will depend on the rocks you collect. My daughter was able to sort white, red, green, and gray rocks. Next, she sorted the rocks based on whether or not they were one color, or had more than one color. My daughter sorted smooth and bumpy or rough rocks. If they had any roughness at all they were put into the rough category even if they had smooth sections. This is a great sensory activity. My daughter sorted square and round rocks. 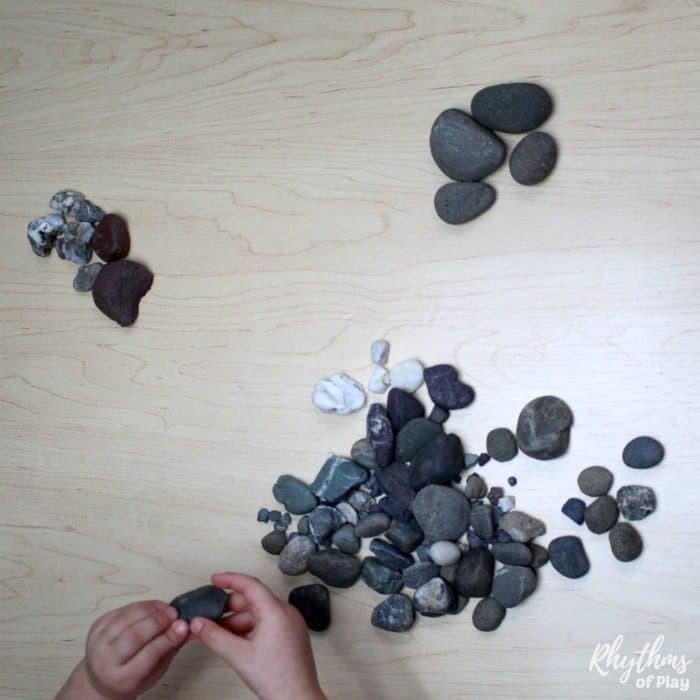 Activities such as sorting and classifying rocks encourage children to focus attention on the characteristics of the objects: visual appearance, textures, weight, dimensions, color, relative size, etc. Counting the results is an easy way to add math to make it a STEM activity. When doing this activity, children make decisions based on the information that they perceive. This decision-making activity helps establish new nerve pathways in the brain. These pathways pave the way to higher learning. 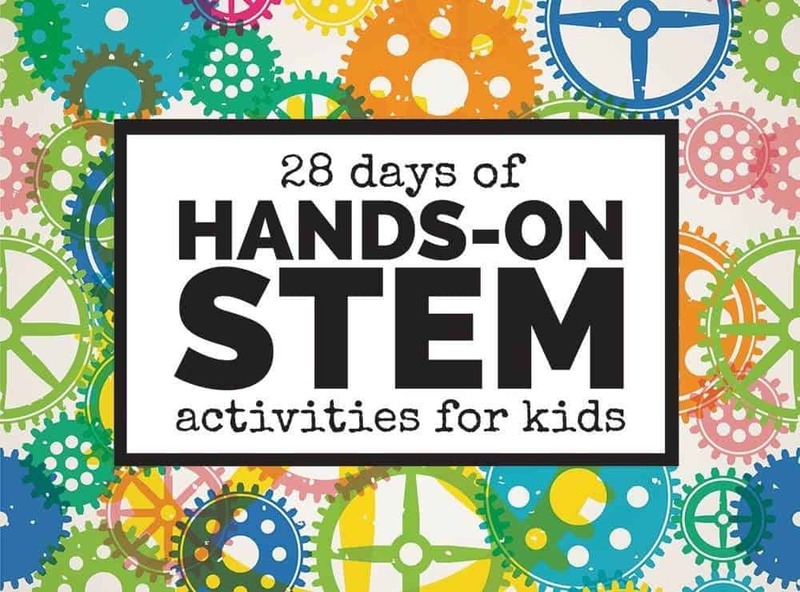 This post is a part of the 28 Days of STEM Activities for Kids Blog Hop. Click on the link to see all of the other amazing hands-on STEM activities for kids!